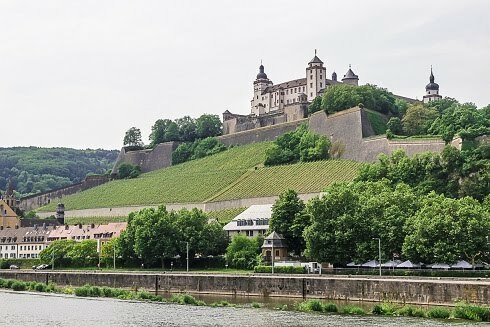 Three Irish missionary monks visited Würzburg in A.D. 686 to Christianize the local 'barbarians'. The inhospitable locals beheaded them. Fortunately, we find the citizens are much friendlier today, and we also discover there are many things to do, great places to see, and excellent wine and food to enjoy. Würzburg, at the northern end of Germany's Romantic Road, has much history, culture, rich cuisine, religious landmarks, and idyllic scenery. It is a great place to visit and the bonus is you can walk between most sites. We start our sightseeing at the majestic UNESCO World Heritage listed 400-room Residenz, one of the most important Baroque palaces in Europe. Unlike many other huge buildings, it was built in a short period of time and was completed in 1780. The building includes a much acclaimed staircase and awe inspiring frescos. We are told that Napoleon Bonaparte slept here for one night in 1812 en route to his unsuccessful invasion of Russia. It is a place we must see. We visit by a self-guided walking tour but there is also a guided tour which allows access to some of the rooms you can't visit by yourself. Don't miss the on-site church. After the walls were completed, a group of court artists created what is one of the most decorative churches you will ever see. 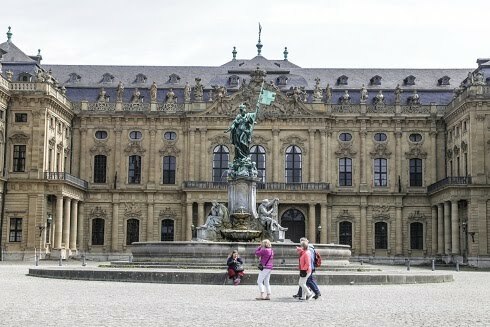 The palace grounds are considered some of the most impressive Rococo gardens in Germany. There is an artificial lake including fountains and some beautifully carved sculptures. There's a wonderful symmetry that can be appreciated from the higher ground. It is not far from here to the Old Town. Our first stop is at the scenic Market Square, where a daily bustling food and flower market is in full swing. Overlooking the square stands St Mary's Chapel (Marienkapelle) with its spire 70 metres into the sky. The striking red-and-white facade of the Gothic church is considered the most important building from that era in the city. Most of Würzburg's old city is a pedestrian zone so it's a great place to walk. When you have done enough of that, pull up a chair at a sidewalk café for some people and tram watching. 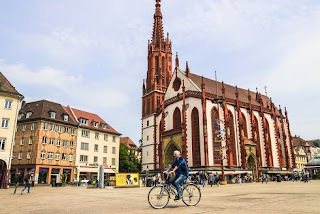 The construction of Würzburg Cathedral with its twin towers began in 1040 and went on for nearly 200 years. 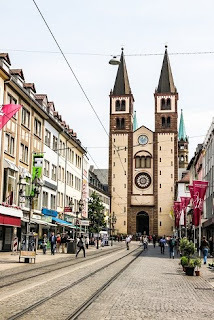 Today, it is the fourth largest Romanesque church in Germany. It is one of the city's most important landmarks and can be seen from almost everywhere. The interior is fresh after a renovation and is well worth a visit. The old Würzburg Town Hall sits on Domstrasse between the old bridge and the cathedral. It is a complex of buildings of different periods. The tower dates from the early 1200s and another part of the building is the only surviving secular building in Würzburg that was built in the Romanesque style. The old Main Bridge from 1120 spans the river of the same name and is considered the oldest stone bridge in Germany. It connects the old town with the nearby Marienberg Fortress. In 1730, the bridge was further decorated with twelve statues of saints and emperors. The Fortress, towering over the city and surrounded by vineyards, was began in 704 AD. It was originally a church then the building was expanded in the Renaissance and Baroque periods with the addition of fortifications. For nearly five centuries it served as a home to the local prince-bishops. Today, the Marienberg Fortress houses the Franconian Museum. You can visit the museum and see the rooms with their period furniture, tapestries and paintings but most people come for the views. Würzburg is surrounded by vineyards cascading down the slopes on both sides of the river and it's easy to see why this is a good wine producing area. Perched on top of a nearby hill sits the Kappele Church with its onion-domed towers. Don't miss the opportunity of having a hearty Franconian meal and tasting some of the local wines. A good place to indulge in German regional specialities is The Bürgerspital wine estate restaurant. You can also take a tour through the estate's famous wine cellar. The best city restaurant is probably the one-Michelin-starred KUNO 1408. It has created its own particular variation on the Franconian theme. Germany appears to have no restrictions against drinking in public, so apart from drinking in bars you can buy your own bottle of wine or beer and sit on the old bridge enjoying the view. 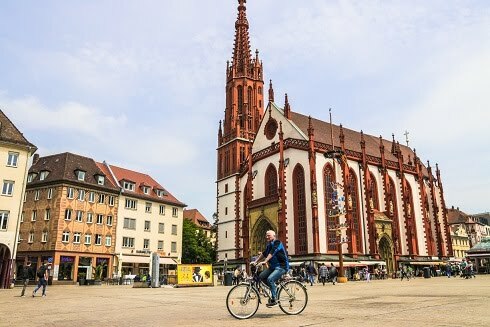 Würzburg is a great stop either before or after your Romantic Road tour because it has many hotels, inns and B&Bs , including a number of excellent hotels in the Old Town.